You know when there's a book on your bedside table that isn't really working for you? It languishes as you read maybe one or two pages a night before falling asleep. Finally, you return it to the library, find something amazing, and devour it in one or two days, no matter how busy you are. When it comes to independent reading, making sure our students are matched with the books they will fall in love with makes all the difference. But most kids who don't already love reading have no idea how to pick out a good book, so how can we make sure they find something they will want to read? 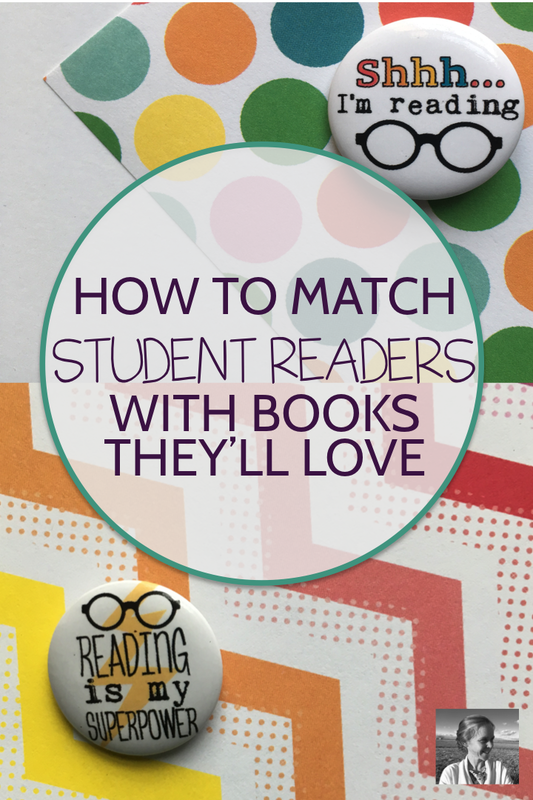 Is it really possible to match every student with a good book, every time? Or at least to try? In short, yes. Though it sounds like an intimidating or even impossible task, there are systems you can put into place to help you a lot. And the more you get to know your students the easier it becomes. Plus, they'll begin passing their favorites along, realizing they can actually enjoy reading, and becoming more active participants in the process. What begins by seeming impossible, will become one of your greatest joys in the classroom. So let's talk about the systems. What follows are nine ways you can operate as a successful matchmaker. Use one or use them all! It would be nice if we could all rely on beautifully stocked, thoughtfully displayed, conveniently located school libraries. But since we can't, having a classroom library that is full of highly readable books is a critical part of matching students with books they will love. Hit half-price book stores, rummage sales, friends' old boxes of boxes, the thrift store, used book stores, and everything in between. Ask for money if you can. Start a Go Fund Me campaign if you need to. Work with your school librarian to pull some books from the school shelves if that's possible. My friend Brynn Allison, of The Literary Maven, is constantly putting together lists of great book ideas. So if you are looking to build up your library consistently, stay tuned to her website as well. We also talk a lot about new and exciting books for students inside my Facebook group, Creative High School English, so feel free to join us there. How you arrange your books makes a big difference! Try to face a lot of book covers out so that students can see all the options, and when you have the time, craft a fun book display like the ones I featured in the spring in my "Classroom Library Hall of Fame." You'll see a lot of fun displays and set-ups in this post, it's definitely eye candy for English teachers. 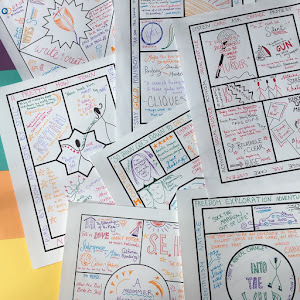 Students will be drawn to look at and discuss the books you feature in your displays, so be sure to put the cream of the crop out in the spotlight. Take a few minutes early in your reading program to survey your students somehow about what they like to read. Whether it's a questionnaire about their favorite books and genres, a one-pager about their own reading life and general interests, or a journalistic assignment in which they write up an article about their own reading history, find a way to discover what makes them tick as readers. Even if all you get is one title that they liked six years ago and the information that they're too busy working after school to read, you have a place to start and some important background about them. I first learned about this idea from Melissa Kruse of The Reading and Writing Haven when I was interviewing her for my podcast episode on book clubs. She called it a book commercial, while someone in my Facebook group recently called it a pitch. It's a great way to have students share what they are reading with the class. Decide for yourself whether to choose a student who you know LOVES their book, or just randomly rotate through all the students. Then as a class opener or to kick off a reading chunk of class, invite the student to stand up and give an argument for why their book is awesome. (Students who don't like their books will need to be matched with a new one and given a pass to try again another day). Reinforce how helpful it is for students to share really specific reasons why they are enjoying the book, so that other students will know if they want to read it. This practice helps generate momentum from within the student community. Certain books will pass from hand to hand quickly, and those matches will all begin to happen authentically without any help from you. Another, even quicker, way to get students talking to each other about their books is to use a quick activity I call "Book hashtags." Simply take five minutes to have students jot down the hashtags they would use to describe their book on Instagram, then ask them to share those hashtags with partners or small groups and explain why they fit their books. This is a super speedy way to help expose new students to great books. Sign up below and I'll e-mail it to you today! Inviting other teachers, parents, administrators, and other staff in to spend five minutes in your classroom talking about their favorite books (which you will just happen to have available for check out, based on your amazing foresight) is a great way to bring new titles into your rotation and help students to see that people besides their English teachers value reading. I like to snap photos of my guests holding up their books and turn them into reading posters, as a nice visual reminder of the recommendations from within the community. (I also like snapping photos of students with books they recommend to turn into posters!). If your school hasn't made the insane decision to cut the school library, get serious about using this resource. The librarian at the school where I work is a BOOK GENIUS. And so many librarians are. Get together with yours and get help in creating an incredible cart of good options for your students. Or talk with him or her about those few students you might still be having trouble matching after a month or two of school, then let those students browse the shelves with your librarian's guidance and recommendations. A quick trip to the library is never wasted time, as long as you have a plan for what to do with your students who already have a good book or choose a book in seconds. I like to have them write down a list of ten books they might enjoy in the future so they don't just start chatting in the entryway. I originally used Blogger to post pictures of the books my students were reading along with a paragraph review. Every once in a while I would pass out an index card and ask them to write the name of the novel they were reading and a short review including specifics about why they would or would not recommend it. Then I would type these into blogger as blog posts, building up a large library of student reviews. Now and then I would ask students to hop onto the blog and peruse others' reviews, making a list of books they might like based on others' reviews. This worked well, and students especially liked to see the little widget I put in the sidebar that allowed them to see little dots where they had readers around the world. Before long it was clear that people in dozens of countries were reading and benefitting from their reviews, which gave them a wonderful authentic audience beyond their own peers. Another, perhaps easier, way to do this now that Instagram prevails would to have students write a short review in a colorful marker, snap a picture of it next to their book with their phone, and send it to you for a class Instagram book review feed. You could simply post it without retyping all the reviews (which was always a bit arduous, I'm not going to lie). You could do something very similar with a private reading Facebook group, asking students to take one minute during class to post a picture of their book with three or four sentences about it and why they do or don't like it. OK, yes. This seems a little obvious. I almost forgot to include it, but it's definitely the most helpful way I match students with books. When students are reading quietly in your class, peek over your own book to see how things are going. Take note of students who are obviously not engaged or excited by their books. Then do a lap, checking in here and there. Walk around and peer over their shoulders for a few seconds, then quietly ask "how are you liking your book?" When they admit that they hate it, invite them over to your fabulous library for a few minutes and, based on whatever you know about them and whatever you can find out in those few minutes, help them choose a new book. You may be able to redirect four or five students a day in this way until all the other systems you have in place start to do it for you. 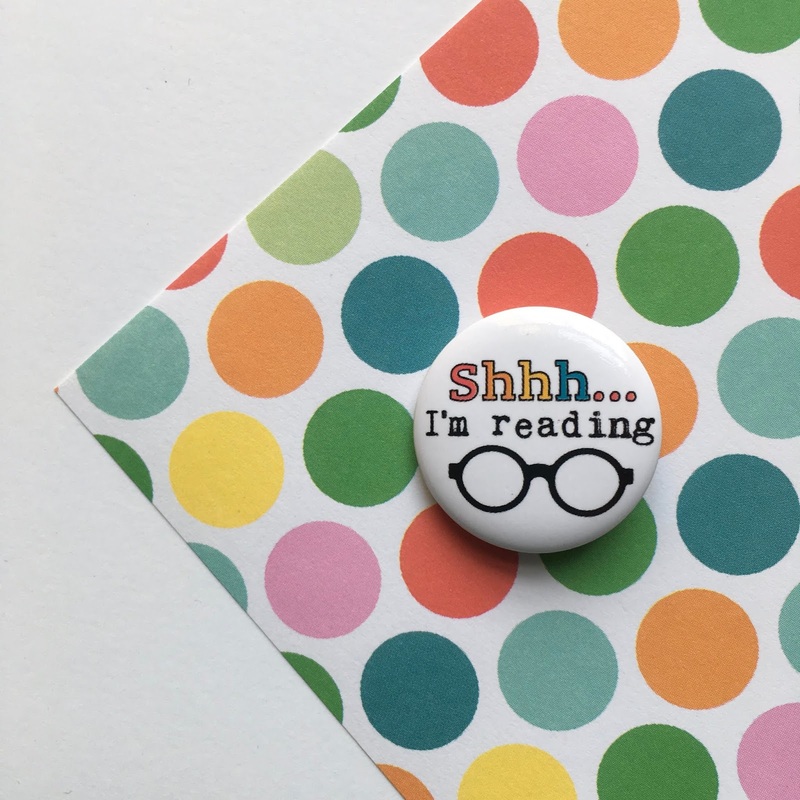 At the end of the year, have the students leaving your class create bookmarks featuring a little about themselves and a little about their absolute favorite book of the year. Photocopy these and use them both as bookmarks and as part of your library display bulletin boards or wall decor. Students rising up in the next year will see their older friends' recommendations and also see what students with similar interests enjoyed from your library. I made you something! 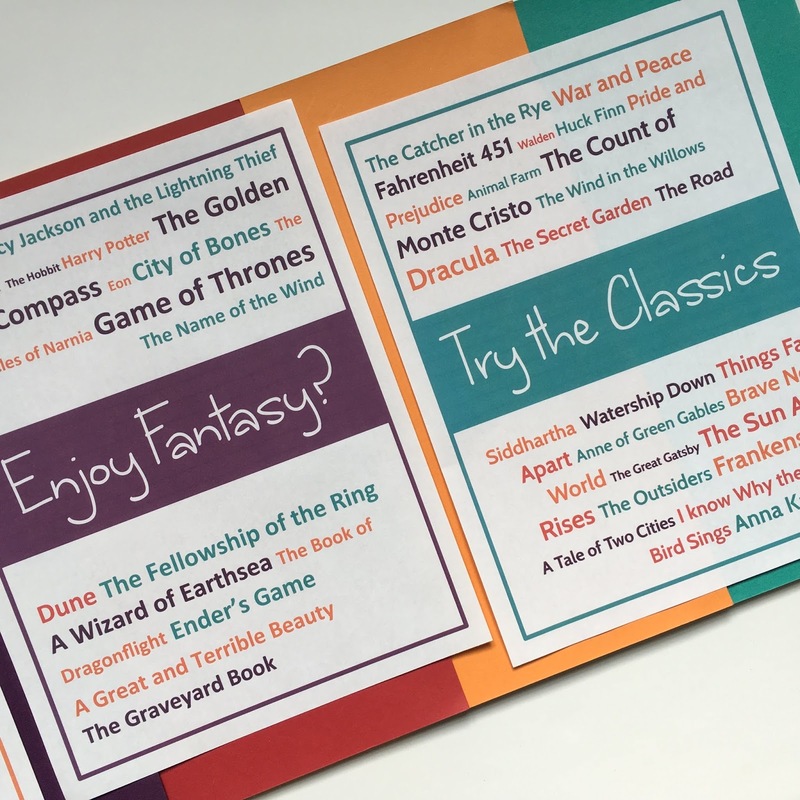 Sign up below to receive a fun set of posters for your independent reading library, and you'll also receive my weekly Friday e-mails full of creative teaching strategies.